One of the big advantages of family businesses is the access they so often give to cross-generational input. As younger family members grow up and take an interest - whether or not they get directly involved - you'll have the opportunity to make use of lots of fresh ideas. 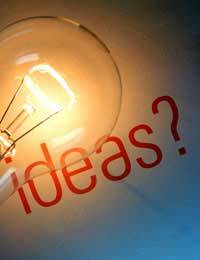 But how can you make the most of these, and where else can you find ideas when your business really needs some fresh thinking? Sometimes you may feel that you keep running up against the same problems and you just can't think of any fresh solutions. It's like banging your head against a brick wall, and your co-workers may be facing the same struggle. But by coming together you may find that you can achieve things that you never thought of on your own. Creative thinkers have long used brainstorming as a technique for breaking through cognitive barriers. By bouncing ideas off each other, you may find that you trigger new thoughts and are able to come up with new ideas. There's no need to restrict these sessions to managers - encourage the involvement of staff who are keen to contribute to the future of the business. In order to keep up with the latest thinking within your field of business, it's important to keep reading the latest associated publications, whether they're newsletters, magazines or email lists. These will often suggest new strategies you might employ, though you should always try to tailor them to your business and make them your own - there's no point in just doing the same thing as your competition. Fresh ideas can also come from communicating with other businesses directly, at networking meetings, through trade unions or through social contact. A useful way to approach this is to keep in touch with businesses working in different areas from you so that you can exchange ideas without creating competition for yourselves, and you can still stand out and seem to be doing something unique within your individual marketplaces. One of the major reasons why it's so important to keep up to date in business is the advent of new technology. This can not only require the development of new skills, it can require changes in the whole way you structure your work, so that you need to think afresh about familiar processes. Often adults struggling with new technology find that their children understand it almost effortlessly, having grown up with different expectations of the world around them. Likewise, young people can find it much easier to determine appropriate ways of bringing new technology into the business. This gives family businesses an advantage, as they can draw on the skills of the younger generation to sharpen up their existing business models. If you are to make the most of new ideas in your family business, it's vital to keep listening to all members of staff, including younger ones. It's easy for experienced business managers to fail to give enough weight to younger people's ideas, as, after all, they haven't worked in business for as long. But sometimes it's precisely because they're less familiar with existing business strategies that they're good at coming up with new ones. Utilising fresh thinking can mean taking risks, which can be off-putting when your business is getting along well as it is, but in the long term every business needs to change in order to keep up with the times and avoid being undercut or outmoded by the competition. A family business can really benefit from the input of the younger generation, so make sure that yours doesn't miss out.